The second concert of the 9th International Pharos Contemporary Music Festival, on Sunday 8 October 2017, will be an exciting percussion experience by Shawn Mativetsky – one of the most dynamic performers of Tabla in the world and a pioneer in bridging the worlds of Western and Indian classical music. Mativetsky is described by the media as “an exceptional soloist” and “as a leading disciple of the renowned Pandit Sharda Sahai”. His instrument, the Tabla, is regarded as the king of the percussion instruments and it has a very distinct sound that makes it an integral part of Indian music. Originally associated with the Indian classical dance Kathak as well as the dance traditions of the Tawaifs (sophisticated courtesans during the Mughal rule in the mid-18th century), the Tabla (consisting of two drums, the Bayan and the Dayan) is now used in a variety of genres and styles of Hindustani music. In Northern India, the Tabla is a ubiquitous instrument which accompanies Hindu religious songs (Bhajan), Sikh linguistic performances (Shabad), the ritual music of the Sufis (Qawwali) and Arabic sonnets (Ghazals). Its sophistication and charm has attracted the attention of scholars, musicians and music lovers around the globe. The popularity of the Tabla as a solo instrument continually grows as time goes on, as the instrument can hold its melodic own for hours and yet not sound boring. It is a much sought after instrument in cross-cultural and fusion musical experiments, and apart from classical music, the Tabla has made its mark on devotional, theatre and film music. For his recital in Cyprus, Mativetsky will perform traditional music as well as contemporary music written for the Tabla. One of the most dynamic performers of his generation, Shawn Mativetsky is a pioneer in bridging the worlds of Western and Indian classical music and he is considered one of the leading ambassadors of the Tabla. Described by the media as “an exceptional soloist” and “as a leading disciple of the renowned [Pandit] Sharda Sahai”, Shawn Mativetsky is highly sought-after both as a performer and an educator, and is active in the promotion of the Tabla and North Indian classical music through lectures, workshops, and performances all over the world. 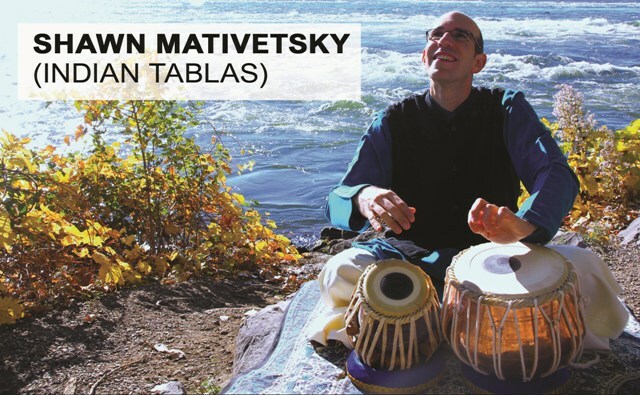 Shawn Mativetsky regularly gives solo Tabla performances, as well as accompanying kathak dance, voice, bansuri, sarod, santur, sarangi, and sitar artists. He has performed numerous solo recitals all over the world and has been featured in series such as the Windsor Canadian Music Festival, Pontio / Music @ Bangor, New Music in New Spaces, Festival Montréal Baroque, New Works Calgary, Music Toronto, and the Percussive Arts Society International Convention. As an ensemble musician, Shawn Mativetsky performs regularly with violinist Parmela Attariwala's cross-cultural Attar Project, Indo-fusion group Ragleela, Indian-folk group Galitcha, and the improvisation trio Of Sound, Mind and Body, with Tim Brady and Helmut Lipsky. In recent years, he has been working closely with santur player Jonathan Voyer, sitarist Uwe Neumann, and kathak dancer Sudeshna Maulik. Based in Montreal, Shawn Mativetsky teaches Tabla and percussion at the McGill University. Since 2003, he has been affiliated with the Pandit Ram Sahai Foundation (UK/India), and he hosted Tabla maestro Pandit Sharda in Sahai's annual summer Tabla workshop. Since 2011, Shawn has been hosting his own annual summer Tabla workshop at the McGill University.